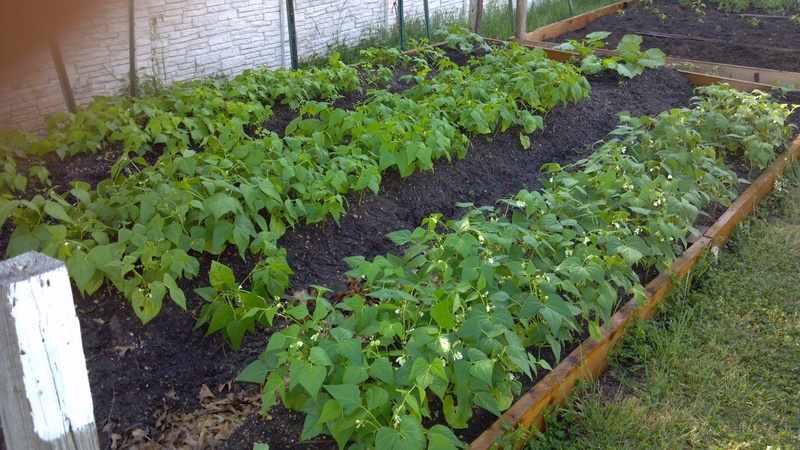 Things are plodding along in the garden beds here. We’re getting close to the “too hot to work outside” season. This is part of what motivates me to stay as busy as I can from Christmas through March around here, so that now, when the heat turns up, I mostly water, watch, and pull a weed or four. To beans that are now three feet tall. (A quick side note: Someone was asking about growth rates for melons. This is my second attempt at melons, but feel it safe to say they are slower growers. 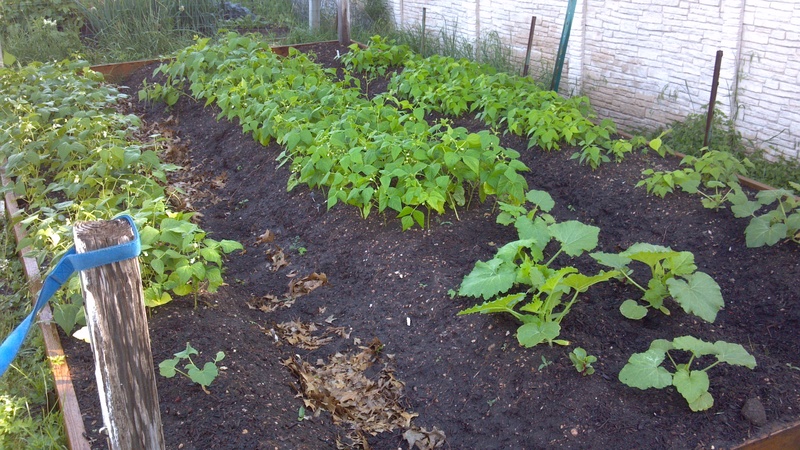 The picture above is of three squash varieties, all direct sown on the same day as three melon varieties.) The melon varieties? A fair bit smaller than two of the squash types. Yet a mere three days later and we have a new surprise! Fire ants aren’t gone just because you think they are. Melons will take their time, but may surprise you in fits and bursts. It’s ok to not be super busy in the garden all the time. Keeping it watered will keep it patient for your return. I like to play with structure. Build forts. Rope ladders. Tree houses. Box caves. I think so many wondrous things fall by the wayside on the wander into adulthood that sometimes as adults we may be just as boring as our childselves would say we were. The consequent mud from said sprinklers. The ever sought and ever rare refrigerator box. The fridge box: I’m not a cardboard composter or mulcher, but others are. Sticks! Sticks are great for small tomato stakes, pea trellising, pole beans, and likely many other things. I’ve known for a bit that I needed some kind of structure for my tiger beans. They’ll survive, and produce, decently without structure. With structure, I’ll get to more of the beans before the bugs do, and I haven’t tested the theory but would almost swear they make more beans while climbing. The issue? I planted them in a row in the middle of a long bed. Oops. I hadn’t planned it that way. I had it drawn up differently. When the day came to sow the seeds, my mind left me so much that I neglected to even reference the plan I’d carefully graphed, and simply sowed away. So it goes. So what was I to do? Perhaps, I postulated, I could put a forked stick at either end of the bean patch, run a cross stick from end to end, and drop lines down from the beam. Except I was fresh out of forked sticks. Teepees? I’ve never had luck with teepees. And then I realized that at some point I had also hoped to enclose the bed. A neighbor down at the garden plots warned of the possibility of large, wandering, hungry wild game (in the form of humans) who would help themselves to the literal fruits of your literal labors. I would like to think this wouldn’t really happen, but apparently it has in the past. DH and I tossed some ideas around. The bed at home has a nice structure that is flexible to the needs of the plants within. We didn’t really want to invest that much lumber into a top structure that would be anchored to a weak (and in places rotting) base structure provided by the community garden maintenance crew. I knew I wanted a shade cloth option, and he convinced me that we could do double duty if we hatched a plan to replace shade cloth with plastic in the winter. Split the length of the bed into four foot sections, starting in a corner. Dig out a small hole (maybe four inches deep) and push a piece of rebar into the soil. Tie the PVC to the corner posts to help anchor. Continue on down the bed, threading PVC onto the rebar that you spaced every four feet. Like DH is doing on the left of this picture, press each side of each rib down into the earth to help anchor it. The bowing of the pipe should create pressure against the side boards of the bed, but pushing the tubing into the ground helps prevent lift-off. Set the chair up under the first rib, and with the seventh length of pipe running under the ribs, lash the “spine” to the “ribs” with duct tape (or twine) just enough to tack it up. Proceed down the length of the structure, tacking each rib to the spine. When you reach the other end, lash it securely, and then work your way back up the bed. This time, tighten the meeting of the two pipes and tape in a cross-cross pattern. Why “ribs” and “spine”? Well, aside from looking a bit like a giant rib cage, PVC and tape were what we used to construct a whale in third grade to put on a showing of The Old Man and the Sea. That, and you knew exactly what I meant, didn’t you? I apologize for the quiet as of late. I am currently out of town, travelling for seven days on business. I took pictures in preparation for the trip, thinking I would have time in the evenings to draft posts. I forgot the camera at home, with the photos still on it. I have not had evening time like I expected, but for good enough reason. I was able to spend a precious three hours with a dear cousin catching up. I was able to catch up on sleep and beat off a bug of my own before it took hold. I was able to get lost in Houston traffic for an hour trying to find socks, only to find instead a travelling carnival, a helipad, a parking lot full of grass-filled cracks in the middle of pristine shiny glass and steel, and then finally – when I’d given up on the search and resigned myself to gladly wander: socks. Tonight was a run. A glorious, much needed, too-long-put-off-for-no-good-enough-reason, run. Little did I realize I had picked just the park that housed the Houston Garden Center. Even littler did I realize I did such a thing until driving out of the park in need of a shower. Perhaps tomorrow when the work is finished but the Rockets game has yet to begin, I’ll have time to go for another glad wandering. And! He took pictures! Don’t those beans look promising? I’ve been carefully checking the undersides of the leaves on each visit in an effort to find any Squash Bug eggs before they hatch. Last year I lost every squash plant to Squash Bugs (not knowing yet what they were.) This year I hope to lose less. I’ve also been warned by my neighboring gardener that the plots are susceptible to Squash Vine Borers, which are new to me. I’m keeping an eye out for any vine anomalies, but am not sure exactly what I’m looking for. I’ll have to read up a bit. I did find one squash leaf coated on the underside with aphids, and it was quickly pinched off and ushered to the trash bin. 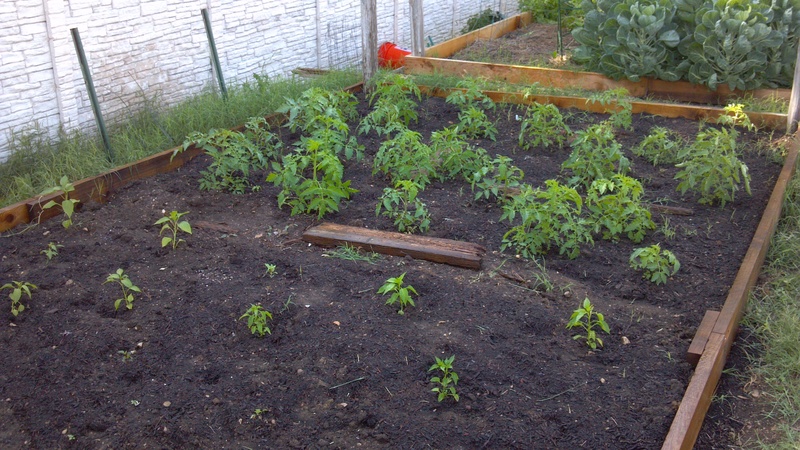 Here are the peppers and tomatoes. The tomatoes are already needing more pruning than I’ve had time to keep up with. Next week when I’m home, I really need to get them staked before they completely go wild on me. There was a flower bud on one Sunday before I left, so perhaps when I make it home this Sunday I’ll have some flowers to tickle until the bees find their new buffet. I planted some strawberries and sweet potatoes last weekend as well, but that will have to wait for me to be reunited with my camera.